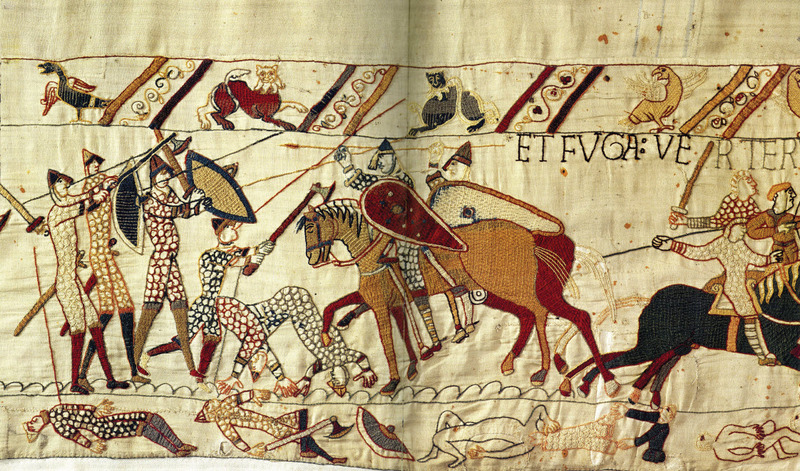 The Bayeux Tapestry is a giant 230 foot long piece of embroidered cloth, depicting the entire Battle of Hastings. It was created in around 1066 A.D., and it served as a visual representation of what happened during that battle. Just to make things easier to understand, the soldiers on horseback are usually the Norman cavalry and the soldiers on foot are usually the English soldiers. On the top portion of the tapestry there is a borer that covers a couple of inches. In this particular border, nothing of importance is usually shown. There is a middle piece of this embroidery, which is where the main action and story happens. At the bottom of the piece is another border, like that of the top, but in this case the bottom often holds valuable information that pertains to the main action in the middle section. In my particular piece, panel 72, it shows English soldiers fighting the Normans. There is lots of death, as depicted in the bottom margins. One particular thing that is out-of-ordinary in the bottom section is that of a man taking the armor off another fallen soldier. During this battle, if there were good suits of armor and weapons that could be salvaged, they would retrieve them. On the far right side of the panel, the reader can see the beginning of the phrase “et fuga verterunt Angli,” which translates to “… and the English have turned to flight.” In the right side of panel 72 and the panel following mine, one can see that the Norman cavalry are fiercely chasing the English soldiers. In these last two panels, panel 72 and 73, marks the end of the tapestry, or at least the pieces that remain today. There is probably more to the tapestry to show the very end of the battle, but those pieces have been lost.